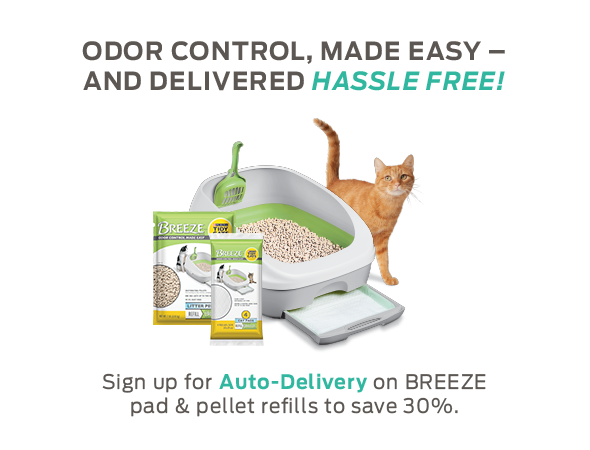 BREEZE Litter System is an all-in-one system that separates waste to make odor control easy. Specially designed, cat-friendly litter pellets that are anti-tracking and 99.9% dust free allow liquids to pass through to the absorbent cat pad below, while helping dehydrate solid waste that remains on top for quick, easy scooping and outstanding odor control. Urine is quickly absorbed by the disposable, odor-controlling cat pad that sits in the tray below. Each system comes with litter box, custom scoop and enough pads and pellets for one cat for one month. BREEZE Hooded Litter System also available.